Mruthyunjaya Homam Dedicated to Lord Shiva to avoid untimely death. 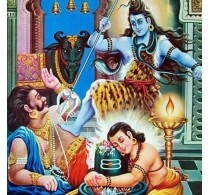 The Mrityunjaya Homa is performed to achieve Jaya or Victory over Mritya or death. The object of worship of this homa is Lord Shiva. One of the synonyms of Lord Shiva is Mrityu Mrityu which means death of the death or the destroyer of death. During this homa one chants 21 mantras. The prominent offerings in this homa are durva grass and an herb called amrita. The former is famous for purifying blood and the latter is a medicine for incurable diseases like arbuda or cancer. Since these are used as offerings in this homa, there is no doubt that it bestows longevity on the performer.